Con·den·sa·tion, the conversion of a substance (as water) from the vapor state to a denser liquid or solid state usually initiated by a reduction in temperature of the vapor. Condensation, or condensation devices, haven’t been used in the design of public space yet but they have a strong potential, they can be used to generate water in arid humid environments especially where there are humid winds coming from the sea or the ocean in the morning or during the night. Many of these devices have been proven functional and in some environments even economically viable to produce fresh water but their application to the design of public space has to be investigated yet outside of the academic context. Some fonts report that the first fog catching programs were developed for scientific purpose in Canada during the 1980s to collect fog samples to be analyzed, others date the origin of these devices back to the 1950s when a team of physics from the “Universidad del Norte” started investigating fog harvesting in the north of Chile, but surely it was in the mid 1980s when this technology has been developed further on in the norther Chilean desert to be used as a water collection device. The Atacama desert, where this technology has been originally developed during its initial stage, is an extremely arid place that spans for more than 1000 km along the Chilean coast with an average rainfall of 15 mm per year, totally insufficient to provide enough water for agriculture and human use outside of the few green valleys where the cities are. Because of its geographic position and conformation this desert is very dry, the central plain is comprised between two mountain chains that block both the humid air coming from the pacific ocean and the air coming from the amazon forest, but in certain coastal locations a phenomena called “camanchacas” occurs daily bringing large clouds of advection fog from the ocean to the sides of the coastal range mountains, these fogs (very rich in humidity) allow small lichens to grow on the arid soil but practically never generates rains as the water particles are too small to form drops. Since the middle eighties these devices evolved from the first prototypes made of wooden poles and nylon mesh to more sophisticated devices that optimized materials and design to increase the water extraction. The main challenge is not technical in this case, but mostly centered on finding a suitable area, placement plays a fundamental role as the final result deeply depends on the periodicity and constancy of the fogs, the quantity of water and humidity of the air, the speed of winds, etc. from the first experiments in the Atacama desert many other initiatives blossomed all over the world. Many of the most interesting projects are taking place on the south american pacific coast, the presence of high mountains right in the coast is an important factor, the enormous quantity of water that evaporates from the ocean is pushed towards the continent by constant winds, on touching the ground this enormous mass of water is forced to follow the steep mountainside upwards where the temperature decreases, this causes the fog to become more humid and therefore to allow more water to be extracted though the fog catchers. 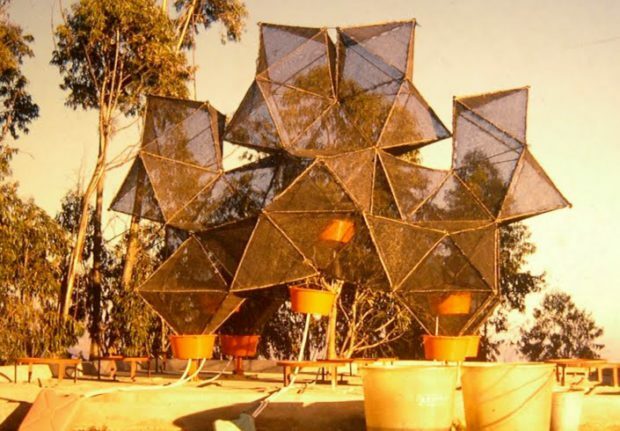 Because of these favorable conditions, many experiments have been carried out in the north of Chile, in Peru and even in some areas in Ecuador that are both exposed to daily fogs and suffer from water shortage. Atrapanieblas Macrodiamante, Carlos Espinosa, 1970, Chile. Image courtesy of Carlos Espinosa via Universidad Catolica del Norte. This design is less dependent on the main wind direction but it is more expensive and requires more maintenance. Although being the most common and cost effective one, the Chilean flat fog catcher is not the only design developed for this scope, many design variations have been developed and considered especially during the last ten years in many parts of the world as architectural school researches (here at the Universidad Catolica del Norte in Antofagasta for example) or by Non-Governmental Organizations (the Canadian Fogquest is the most famous but also the Dutch Creating Water Foundation), humanitarian foundations (like the Dar Si Hman in Morocco) or even commercial organizations (e.g Agua de Niebla en las Islas Canarias). This last experience is probably one of the most interesting, not only because of the high engineering level reached (these devices maximized the efficiency occupying much less space than the classic Chilean ones) but also because it has proven to be economically sustainable to extract water from fog creating “extracting farms” for the local use or even to be bottled and sold. With the correct positioning and design fog harvesting is not just a scientific experiment anymore, the Canaries experience together with the work of the Fogquest team, proved that providing water to secluded communities that don’t have access to fresh water doesn’t depend only on water tank trucks. The fog harvesting devices also contributes to the creation of community sense that only a precious and scarce resource like water can foster, the success (or the failure) of many projects related to this field largely depended on their capacity to create a community of people that care about the maintenance of the system, beginning with the devices themselves down to the practical usage of water, being it for agricultural irrigation or only for human use, due to the poor community collaborations many of the project that the Fogquest team started were abandoned or underused. This connects with the main objective of this investigation, which is the creation of public spaces, it is evident at this point that many times the simple installation of a condensation device is not enough to guarantee its success and it’s truly important to develop a community feeling around it. 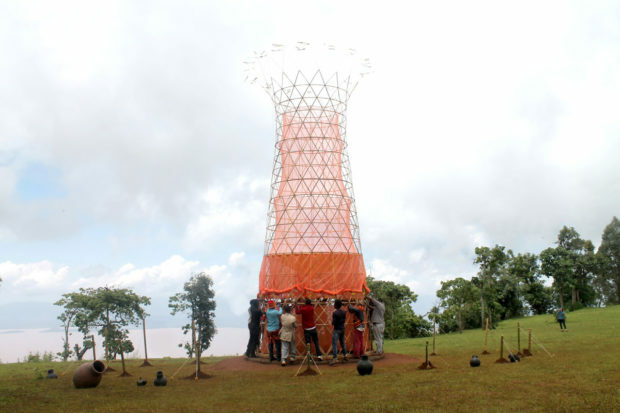 The Warka Water experimental project, is a clear example of the approach, it is focused not only on finding an efficient shape to harvest water from fog, but also, and the two things are equally important, to generate an object that could serve as a center, or a landmark, for the small village it is going to serve. 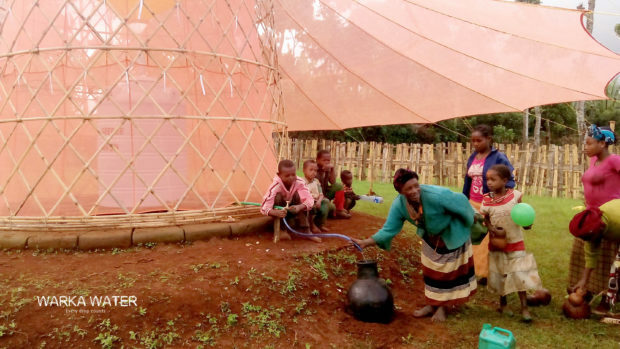 Built with inexpensive and local materials it is designed to be easily assembled in-situ without the necessity of specialized handwork or tools, a few people can erect it in less than few hours in any suitable space. 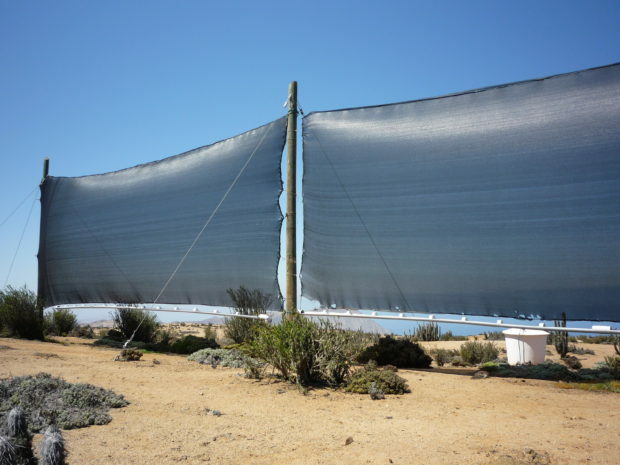 The designed element is less demanding in terms of foundations than the standard Chilean version or the highly engineered Canarian one that are continuously exposed to unidirectional winds, its form is more stable although it might be less performing at the moment of extracting water. Naturally this factor, which is fundamental, can’t be easily determined as the quantity depends on the specific site, orography, presence of vegetation etc. What is interesting in this case is the will to create a gathering point around the water, the fog catcher is not a mere water extractor but becomes what the well was in many medieval villages, a gathering point where people meet to collect water but also to talk and gather. In the last years many architecture students got fascinated by the possibility of extracting water from thin air, and started working on the landscaping possibility of water catching, many interesting examples can be find in this diploma project for the Tenerife island in the Canaries and also in this one, both developed at the Universidad Europea de Madrid and in this competition for a park in Peru. This post is part of the results of the research about bioclimatic adaptive design for public spaces under extreme climate conditions developed at the “Architecture Institute” of the Camilo José Cela University in Madrid, Spain during 2016 spring term. No comments. Yours could be the first. networkedurbanism.com is a platform for sharing knowledge and design thinking experiences with the world around us, breaking through the walls of academia in an attempt to improve the society in which we live. networkedurbanism: This website has been created solely for educational purposes, and not for profit or commercial distribution of any kind. All rights from the content belong to the authors or to the corresponding educational institutions.